The Art Deco influences found in many great examples of architecture inspired this collection of designs. Combine and coordinate borders with fills to create your own frieze or dado creation. Many palettes available to suit your needs. Borders are sold by the roll in 10' and 15' lengths. Borders, friezes and wainscotings can also be printed on a variety of fabrics so you can incorporate these designs into your window treatments and lightweight upholstery needs. 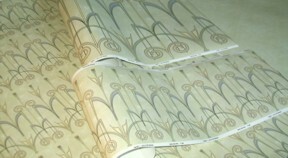 Need a historic wallpaper reproduced? We can scan scraps of your old paper or fabric, color-match, or change the color if you prefer, and print custom paper for your entire room. Perhaps you have your own design you would like printed. Let us know!